Do long car rides leave you hurting? Not anymore! Combining ergonomic design with our “Clever” memory foam, this slim wedge provides comfortable lumbar support to make every ride more enjoyable. JUST THE RIGHT WIDTH: Delivers ample, comfortable support. Narrow enough to fit into the center of most car seats without buckling or bunching. Size in inches: 18″ front x 16″ back x 15″ side x 2″ x high (at front) and 2.5″ high (at back). NOTE: initially the car cushion may have a strong scent, due to the high quality foam used, but this will dissipate after 48 hours. Does sitting in your car or truck for long periods cause you to suffer nagging back pain? Enjoy spending time in your vehicle again with the Clever Yellow Driving Comfort Cushion! This premium orthopedic wedge tilts your pelvis just the right amount, for better posture and reduced pressure on the pain-producing structures in your back. It even has a cutout for your coccyx-your tailbone will thank you! Unlike other memory foam cushions that provide little support and flattens over time, ours features exclusive three-layer technology for maximum support and comfort. It starts with our ventilated mesh cover fabric that keeps your body cool and won’t overheat (even when left exposed to the sun). Beneath that is a thin layer of top-grade memory foam for supreme cushiness. The base of our wedge is our innovative Clever Molded Foam. This dense foam has an outer “skin” that allows it to retain its shape over time-it’s the same technology used by Rolls Royce in their car seats! 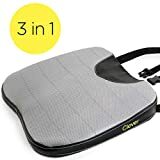 What do customers love most about our car seat cushion? Beyond its exceptional comfort and firm support, our wedge stays right where you put it. It secures to your seat with an adjustable strap-no more annoying shifting and sliding.